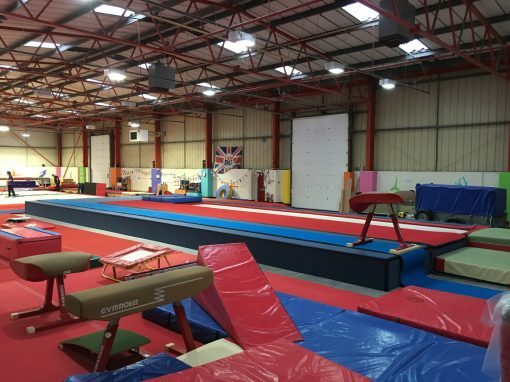 City of Leeds trampolining club (in association with Leeds rebound gymnastics club) were looking for their own premises having been located in several leisure centres in and around the Leeds area. 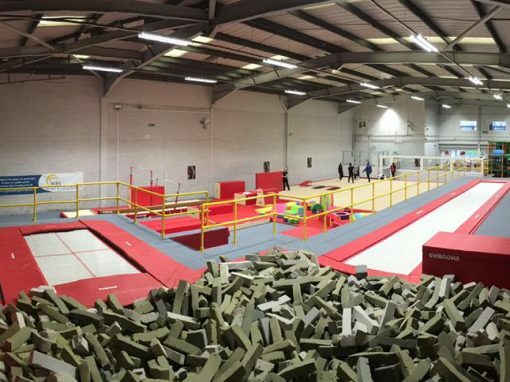 Once suitable premises had been found Wright Building Services conducted a site visit to discuss the requirements and to provide a set of CAD drawings taking into consideration the safety aspects and requirements of the club. 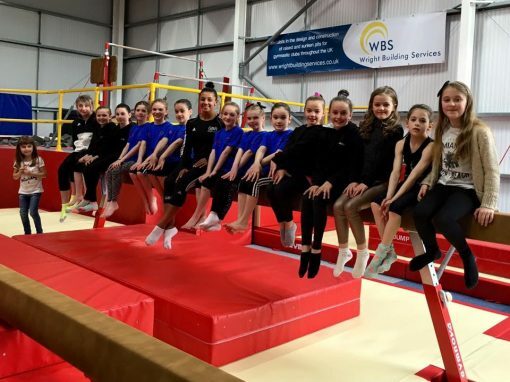 It was agreed that a 1200mm high raised podium would be ideal due to building height, trampoline sizes, landing areas and other recessed equipment. We had several designs/layouts to offer and with on-going discussions between ourselves and the club we produced a design that was safe, within guidelines and suitable for the use of existing floor equipment. 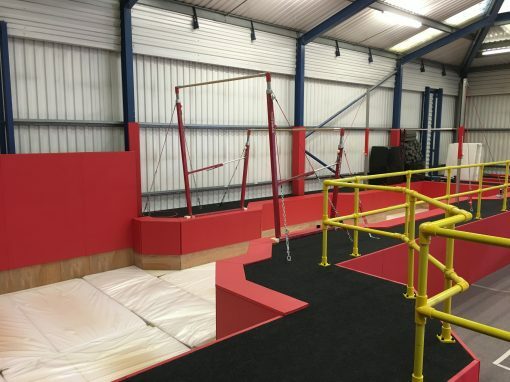 Our tried and tested structural timber design was utilised on this project to ensure the safety of the users and a lifetime of usage. All the timber was treated to guarantee its lifespan and structural calculations were implemented to ensure user safety. 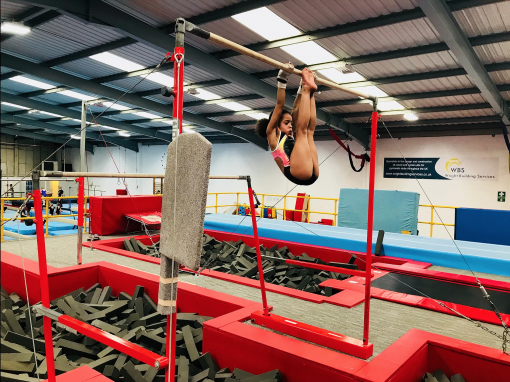 After approval the raised podium framework was then manufactured at our premises, which took just over a week using our specialised framework jigs. All the staircases, recessed equipment walls etc. were also fabricated at our workshop thus reducing the time spent on site. Timescales were tight on this project as the client had specified an opening date which we needed to adhere to. Once the manufacturing had been completed we arranged for transportation of the components to the club’s premises in advance of the agreed start date. 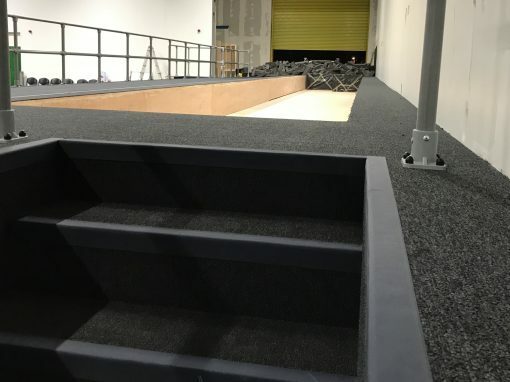 Following the planned two-week installation (including handrails and carpeting) we then assisted with the fitting of equipment and the raised podium really started to take shape. 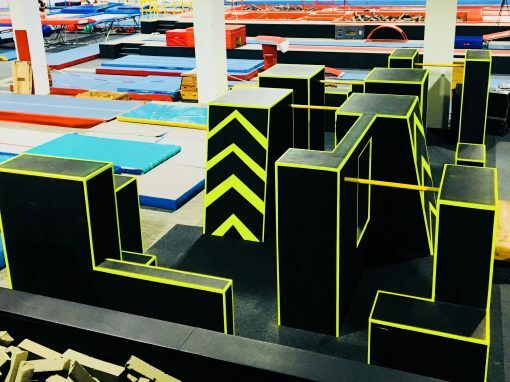 The 1200mm podium incorporates a recessed tumble track, fast track and DMT track, all with run-ups, and all sitting flush with the podium, these enter the main loose foam landing pit. 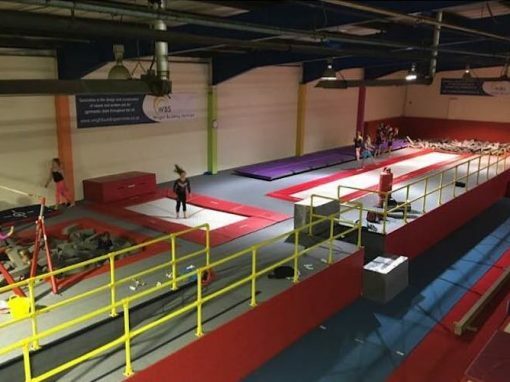 Four full size trampolines were also fitted into the podium between the fast track and the DMT track; being 1200mm high these sat on the original floor and finished level with the top of the podium. 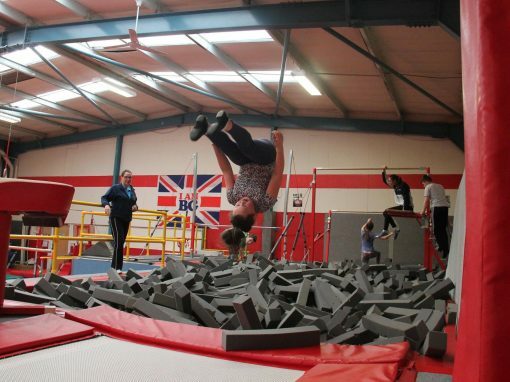 An area for a set of A-bars was also incorporated with its own a full-size loose foam dismount area. 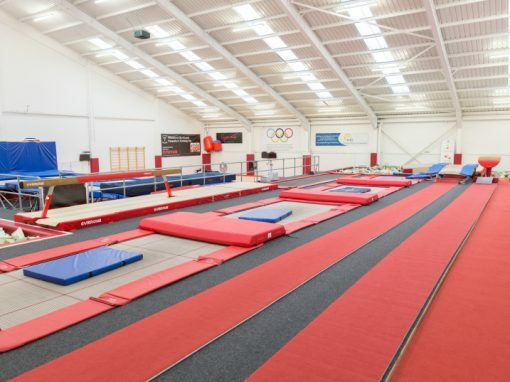 The cladding of this project was handled in conjunction with our supplier, Tracks2000, and included the landing pit walls, exterior podium walls and steel stanchions. As with the timber frames these were prepared off site to allow for a timely installation.